“It’s not your father’s night school,” says Cruz Arroyo, Director of Extension Programs at Saint Martin’s University in Lacey, with a laugh. Saint Martin’s has four distance learning campuses that offer evening and online courses: two at Joint Base Lewis-McChord (JBLM), one in Everett, and one in Centralia. 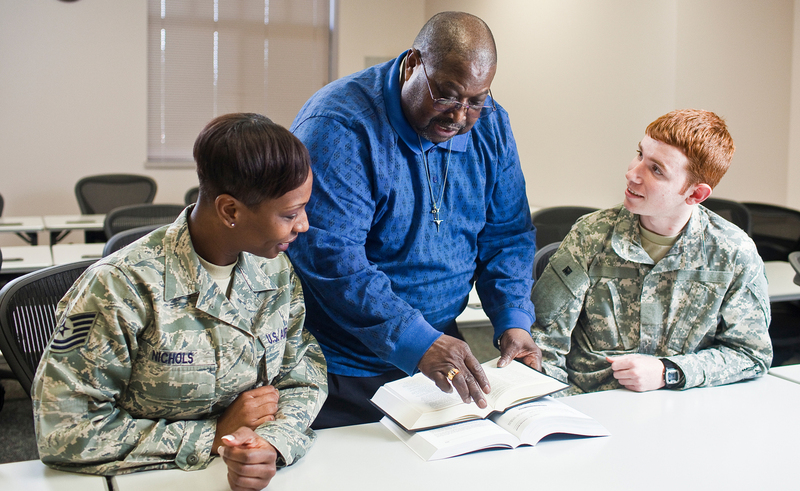 And this year marks the 40th anniversary of Father Richard Cebula introducing Saint Martin’s College degree completion programs for military members and their families at what was then Fort Lewis. A McChord Air Force Base campus soon followed. The JBLM campuses are now made up of the JBLM Main campus and the JBLM McChord Field campus. As of 2010, more than 4,000 military affiliated and other non-traditional students have graduated from Saint Martin’s University over these last 40 years. Saint Martin’s University’s JBLM Main campus is part of a beautiful brick building at JBLM (Stone Education Center) built specifically for education. The facilities have come a long way since 1972, when those first Saint Martin’s satellite classes took place in old wooden barracks. Saint Martin’s building is joined on a college mall with several other colleges and universities that operate at JBLM. These institutions all work together to make sure the courses they offer complement one another with no duplications. Saint Martin’s currently offers seven undergraduate majors through its Extended Learning Division: accounting, business administration, computer science, criminal justice, political science, psychology, and special education. It also offers graduate degrees in business administration (MBA), education (MED and MIT), and engineering management (MEM). There are also post-baccalaureate certification programs for elementary and secondary education teacher certification. It takes 128 semester hours to complete a bachelor’s degree. If a student comes to Saint Martin’s with 64 semester hours from another institution – having already completed an associate’s degree, for instance – the remaining 64 semester hours can be done through its Extended Learning Division. But the university does have great partnerships with other colleges at JBLM, two-year schools such as Pierce College and Central Texas College, and students wanting to complete a bachelor’s degree can start there, and finish with Saint Martin’s. 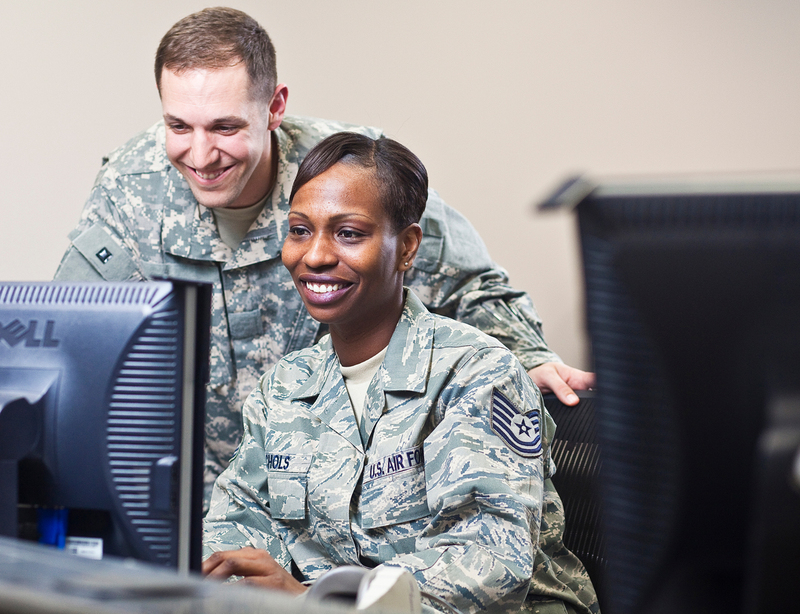 Saint Martin’s Distance Learning Programs are online courses managed by McChord Field staff. Using an online learning program called Moodle, professors and instructors create and lead virtual classrooms, with forum discussions, real-time chat, posted lectures, PowerPoint notes, video, and more. The quality of courses offered through any of Saint Martin’s extended learning campuses or online programs is equal to any given on-campus at Saint Martin’s in Lacey – meaning students can expect challenging classes taught by exceptional professors and instructors. Adjunct professors and instructors are professionals in their fields. Many spend daylight hours working in the field in which they teach. Some have retired from full-time teaching and now teach part-time for different universities. 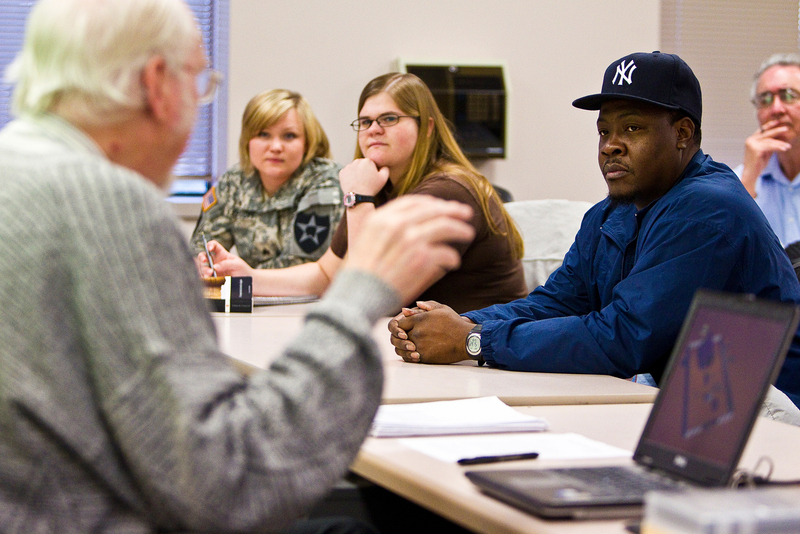 The real-world experience these professors bring into the classroom is priceless. Imagine taking a criminal justice course taught by a prosecutor who can give you the real-time, inside scoop. Or police officers or sheriffs who have law degrees and teach at JBLM. Students in Saint Martin’s Extended Learning Division (which encompasses the Everett, Centralia, and both JBLM campuses, plus its Online Program) follow a different academic year from students at the Lacey campus. In the traditional 16-week program on the Lacey campus, students go into a classroom for 50 minutes, five times a week. This affords students at JBLM, for instance, the ability to do complete their normal daytime work, and then take a class at 5:00 p.m. or 7:50 p.m. 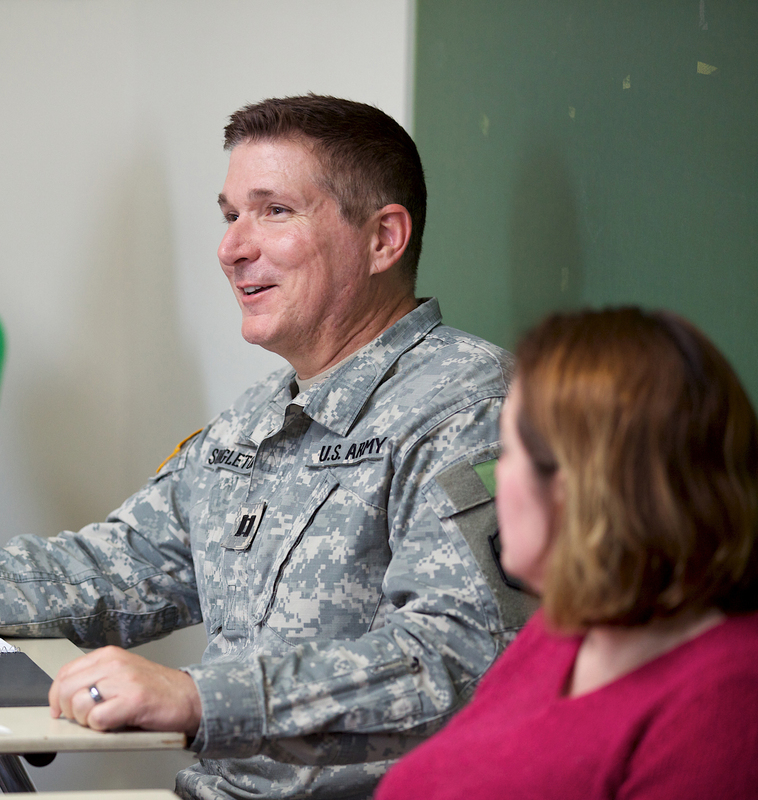 Distance learning at Saint Martin’s began in 2006 as more military members came to Arroyo, explaining that, although they were deployed, they wanted to continue their education with Saint Martin’s. “And now extended learning campuses are such an integral component of this university,” says Arroyo. “We want to continue to grow and support more non-traditional students, especially our military men and women,” says Dvorak. Saint Martin’s was selected for the 2006 Ray Ehrensberger Award for Institutional Excellence in Military Education – named the best school out of 2,800 Servicemember Opportunity Colleges. 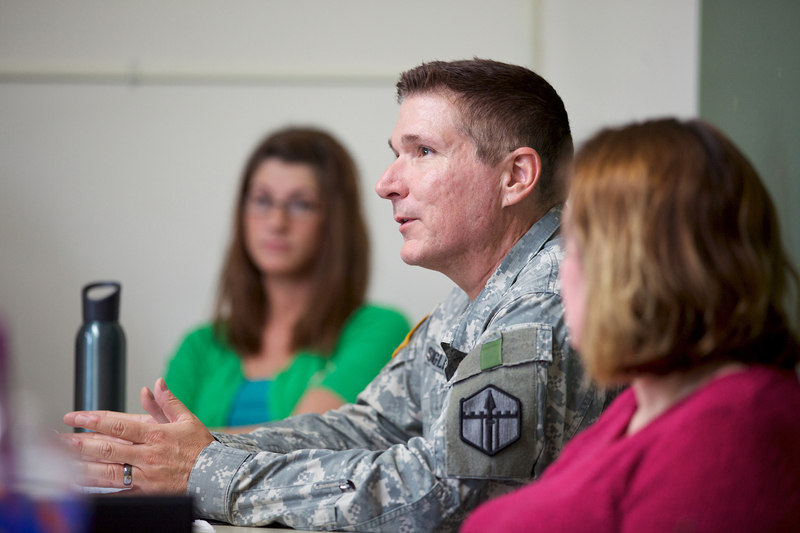 The impact Saint Martin’s has on its military students is remarkable. Arroyo has many moving stories to share. “It’s more than just academic,” he says, handing this writer a copy of an email Saint Martin’s received in October 2009 from deployed student Eugene Hicks, a First Sergeant member of a Stryker Brigade (A Company 1-17th INF REGT) taking online courses. In the email, he talks about the difficulties his unit had seen. At the time of his writing the email, his unit had had 15 killed and more than 20 wounded in action. A month after writing that email, SGT Griffin was killed, along with his entire Stryker crew, by an IED. “This university – the Board of Trustees, everyone – made sure he graduated,” says Arroyo, his voice filled with emotion. “That’s what we’re here for. It’s not about courses, it’s not about graduating students; it’s about serving those who serve us.